Kate began line-dancing at the age of 8, and has been dancing with Stacey since 1997. Kate began her dancing career in line dancing, and since then has progressed to many other styles including jazz, ballet, tap, hip hop, ballroom and many others. Kate and Stacey opened the Cowboys & Angels Dance Academy in 2007 and since then have been able to expand the dance school to cover a variety of different styles, and now multiple teachers. Kate thoroughly enjoys teaching and competing, and is honoured to be able to share her love of dance with so many others. In 2013, Kate was lucky enough to travel over to Blackpool, United Kingdom for the World Line Dancing Championships, the World Dance Masters with Stacey, Jamie and Ben. Kate came away with a World Champion Title for the Open Duo section with Stacey, a third overall for the Young Adult solo section, and a third for the Open Quad Team. This achievement was completely unexpected, and has now given a new challenge/goal for the Australian Line Dance community. Stacey began dancing at the age of 4 in the local dance school in Romsey. Stacey has been involved in dance classes of many genres for over 24 years. Stacey completed a Degree in Dance at Deakin University, and together with Kate, opened the Cowboys & Angels Dance Academy in 2007. Stacey has devoted a great deal of her time to this dance school and is proud of what they have been able to achieve. Stacey has taught many styles of dance and many different age groups ranging from 3 year olds to adults and hopes to be able to continue into the future. In 2013, Stacey was successful in winning a sponsorship position to represent Australia at the World Line Dancing Championships, the World Dance Masters in Blackpool, United Kingdom with her performance of her solos at the qualifying event in Tamworth. Stacey came away with a World Champion Title for the Open Solo, Open Duo, and a third for the Open Quad Team. This has been Stacey's greatest success in dancing to date, as well as a major success for Australian Line Dancers. 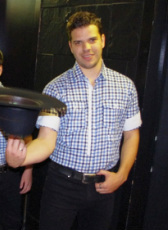 Jamie started dancing at the age of 7 with his mum at Stampede Line Dancers. Jamie started competing 4 years later and over that past 18 years of dancing Jamie has been introduced to new styles of dance including Line dancing, Hip Hop, Rock ‘n’ Roll, and Ballroom in solo, duo, partner and group dancing. Jamie has had the privilege of dancing all around Australia and recently in the UK. Jamie came away with a first overall for the Young Adult Male Solo, a third for the Open Duo, and a third for the Open Quad Team. Dancing has become a way of life for Jamie and he has had many of his greatest achievements through his dance career, including meeting his closest and dearest friends. Jamie enjoys sharing his dancing with others and seeing the pleasure they get from his dancing. Sarah has been dancing since 4 years of age and has experience in many styles of dance. Sarah considers dance as not just a hobby, but a commitment as dancing has become a part of her life that she could not imagine being without. Sarah has competed with the Cowboys & Angels Dance Academy over the past 10 years and met many great people along the way, some of which have become her closest friends. Sarah has taught at the Dance Academy for the past 7 years, she has enjoyed her time here and hopes to continue for years to come. Emily has been a line dancer for the past 13 years and continues to enjoy it to this day. Emily joined the Cowboys & Angels Dance Academy Senior Line Dance team in 2007 and has been successfully competing Australia wide since. Emily introduced Contemporary Dance and Jazz to her repertoire in 2008 and has continued to learn and grow as a dancer. Emily joined the teaching team in 2011 and has demonstrated and passed on great enthusiasm for dance in this time. Emily has thoroughly enjoyed her time teaching a fantastic group of students who are eager to learn. Taylah has danced with Cowboys and Angels since 2008 when she was 9 years old. Over her time with Cowboys and Angels, Taylah has has experienced various styles of dance, from jazz to contemporary, but her main passion lies with line dancing. Competing since 2009, Taylah has been lucky enough to experience countless amazing moments, with the Cowboys and Angels team she considers her second family. Winning the Australian cup 5 times with the team and taking out two titles at the World Dance masters top her list of achievements, however the most important aspect of her dance career are the friendships she has built with people across the country and the world. Taylah is looking forward to another great year of teaching at the school, and can't wait to create more dancing memories alongside her talented students. Karlie joined Cowboys and Angels Dance Academy in 2010 and started competition line dancing in 2011. Karlie has experienced many styles of dance from contemporary to jazz, but has always stuck with line dancing. Karlie has been lucky enough to have had the opportunity to dance right around Australia and the UK, and has met some incredible people along the way, one being one of her best friends. Some of Karlie's most treasured memories are ones made with the Advanced team, including winning 5 Australian cups, and walking away from the 2014 World Dance Masters with two team titles. Karlie is very excited to start her first year of teaching at Cowboys and Angels and hopes there are many more to come.